ABSTRACT: Theory of intersectionality has contributed greatly to the study of intersecting social inequalities, yet its application to quantitative methods is still quite limited. Use of multilevel models has advanced this approach by analyzing contextual factors in association with individual-level sources of inequality, yet the conventional approach tends to treat social constructions, such as race, class or gender, as fixed concepts that do not vary between socially meaningful clusters, such as organizations or cities. This methodological restriction limits our ability to interrogate intersectional relations and analytical categories. In order to overcome this shortcoming, this paper shows how simultaneous estimation of within-cluster effect and between-cluster variations in covariates using hybrid-effects models extends the theory of intersectionality and its application on quantitative analysis of social inequality. Using the Census data for the 100 largest cities between 1980 and 2007, my analyses deconstruct analytical categories and capture group-based disadvantage that is fixed across cities (intercategorical), as well as the effects of social groups that vary between cities (ecological). By using within- and between-city interaction terms, my models show how baseline within- and between-city effects of race, education and gender could be narrowed or widened through changes in city-level share of immigrants. ABSTRACT: Prior studies have examined immigration-induced queuing, competition and outsourcing mechanisms separately and did not consider gender as an intersecting factor in deconstructing the wage impacts of immigration. In contrast, this study examines immigration as a dynamic source of regional gender wage inequality. Immigration impacts native-born men and women differently and the differences are meaningful for explaining regional variation in gender wage gaps. Immigration-induced outsourcing of housework is associated with narrowed gender wage gaps, while an increase in the immigrant share of highly educated workers is linked to a higher wage for highly educated native-born workers and a lower wage for native-born workers without college education irrespective of gender. On the other hand, an increase in the immigrant share of least educated workers is associated with a wage decline for native-born men without college education and a wage increase for native-born women with college education. These findings together provide support for job queuing and competition theories, while also highlighting the fact that the wage effects of immigration are gendered. The paper concludes by outlining the policy implications of the study for work-family conflict and immigration policy reforms. ABSTRACT: The wage effects of immigration on low-skilled workers has been widely studied, yet much of this research has focused on low-skilled men, paying little attention to subgroup variations among women. In contrast, this paper conceptualizes the effects of immigration as context-specific, meaning that gender, race/ethnicity, education, and motherhood all intersect to produce geographically- and time-specific effects of immigration on women’s earnings. Using the decennial U.S. census and the American Community Survey data for 1980 to 2007, this study estimates the wage effects of immigrant concentration in three different labor pools – highly educated, least educated, and private household services, across the 100 largest Metropolitan Statistical Areas. The results from multilevel models deconstruct positive and negative aspects of immigration on the wages of native-born women, demonstrating that existing racial/ethnic, education, and gender inequalities can be exacerbated and eroded simultaneously through immigration. Policy implications of this research are discussed. Misra, Joya, and Eiko Strader. 2013. “Gender Pay Equity in Advanced Countries: The Role of Parenthood and Policies.” Journal of International Affairs. 67(1): 27-41. ABSTRACT: Despite dramatic changes in women’s re-presentation in employment, the gender gap in pay remains substantial in most advanced, wealthy countries. Our analyses show the important role that parenthood plays in explaining the gender wage gap. While childless women’s wages are converging with that of childless men, mothers’ wages are substantially lower than fathers’ wages in many countries. Fathers earn bonuses relative to childless men, while mothers suffer penalties relative to childless women. Even though the gender gap for childless workers has been declining over time, the motherhood penalty remains stable, controlling for a variety of factors such as education and experience. We show how the gender gap, motherhood penalties, and fatherhood bonuses differ across a range of wealthy countries. Furthermore, we discuss how maternity leaves, paternity leaves, parental leaves, and publicly subsidized childcare can help address these inequalities by helping parents-both men and women-engage in employment and caregiving. Finally, we argue that policies need to target wage inequality not only by gender, but also by parenthood. ABSTRACT: The motherhood penalty refers to the lower wages mothers may earn, relative to childless women, controlling for the factors that influence pay. The United States military operates and subsidizes high-quality child care for military families, making it unusually supportive for working parents, including single mothers. Moreover, the military strongly enforces equal employment opportunity policies and has been found to ameliorate various forms of racial inequality found in civilian society. Do these policies mean that mothers, partnered or single, earn wages more similar to childless women? Are racial inequalities in the motherhood penalty also ameliorated through these policies? Using data obtained through a Freedom of Information Act request (2002–2009, N = 193,899), this study finds that the motherhood penalty exists in the military and that race and marital status impact the magnitude of the penalty. However, the ways in which race/ethnicity, marriage and motherhood intersect depart meaningfully from civilian studies. Strader, Eiko with Jennifer H. Lundquist H. and Devah Pager. 2018. “Does a Criminal Past Predict Worker Performance? Evidence from America’s Largest Employer.” Social Forces. 96(3). ABSTRACT: This paper is one of the first systematic assessments of ex-felons’ workplace performance. Using FOIA-requested data from the Department of Defense, we follow 1.3 million ex-offender and non-offender enlistees in the US military from 2002 to 2009. Those with a felony background show no difference in attrition rates due to poor performance compared to those without criminal records. Moreover, ex-felons are promoted more quickly and to higher ranks than other enlistees. At the same time, we find that ex-felons are slightly more likely to commit a legal offense in the military system (5 percent of non-felons compared to 6.6 percent of ex-felons). We also find a higher rate of work-related deaths among the ex-felon sample; closer evaluation of limited data suggests this may be driven by ex-felons being assigned more often to combat positions. Overall, our study shows that the military’s criminal history screening process can result in successful employment outcomes for ex-felons, at least in terms of job mobility and reliability, to the mutual benefit of employer and employee. An important question arising from this analysis is whether the military’s “whole person” review can apply successfully to the civilian sector. Strader, Eiko, and Joya Misra. 2018. “Poverty and Income Inequality.” in The Cambridge Handbook of Social Problems. ABSTRACT: Global-scale economic crisis has brought renewed attention to issues of poverty and inequality, yet we often fail to critically examine what we mean by inequality. Poverty and inequality are social constructions; therefore, how they are defined has important implications for how societies understand and address inequality. This chapter provides an overview on measures and concepts used to study poverty and income inequality from a comparative perspective. We discuss the issue of poverty and consider how social citizenship framework of T.H. Marshall opens new ways of understanding inequality. Increasing inequality has created a new class of poor, who are not only materially deprived, but are also deprived of political and cultural life, unable to participate fully as a member of a society, or are “socially excluded.” We argue that clarifying what we mean by social rights allow us to more concretely discuss the concepts of needs, equality and social inclusion. Strader, Eiko, and Joya Misra. 2015. 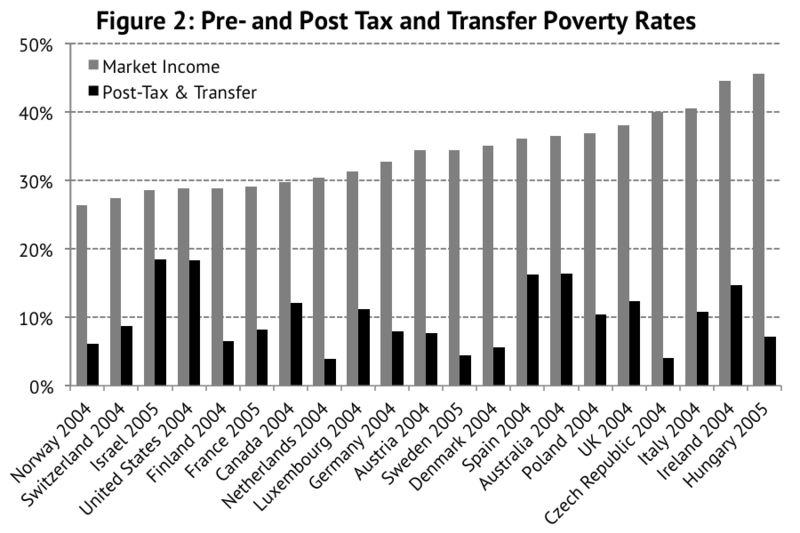 “Anti-Poverty Policies and the Structure of Inequality.” Pp. 259-267 in Routledge Handbook on Poverty in the United States, edited by Haymes Stephen, Maria Vidal de Haymes, and Reuben Miller. New York: Routledge. Misra, Joya, Stephanie Moller, Eiko Strader, and Elizabeth Wemlinger. 2012. “Family Policies, Employment and Poverty Among Partnered and Single Mothers.” Research in Social Stratification and Mobility. 30(1): 113-128. ABSTRACT: The risk of poverty for single mothers ranges from less than 2% in Sweden to more than 35% in the United States; less extreme cross-national variations also exist for partnered mothers. We explore which family policies are most effective at directly reducing poverty among families with children, and whether these policies indirectly reduce poverty through supporting mothers’ employment. We combine microdata from the Luxembourg Income Study with the Work-Family Policy Indicators dataset, and use multilevel logistic regressions to examine the associations between policy and poverty, controlling for individual-level factors. We find significant effects of family allowances, generous parental leaves and childcare provisions, with more powerful effects for single mothers. We further show that parental leave and childcare operate through boosting mothers’ employment, illustrating that work-family policies are useful for reducing poverty by enhancing mother’s employment. ABSTRACT: Previous scholarship characterizes the U.S. as a “liberal” welfare state that provides limited support to its neediest citizens. We theorize and document a large, shadow welfare state consisting of the U.S. military and penal system. Together these institutions provide millions of people near-free health care and other costly supports regardless of recipients’ means. But these benefits come at the expense of fundamental political rights. Soldiers can be ordered to risk death, mutilation and lasting trauma. Prisoners lose their right to vote, and can be denied jobs and housing even after leaving prison. We present the first systematic comparison of benefits data from regular welfare agencies, the military and the penal system. Our analysis reveals a welfare regime that is intrinsically undemocratic and heavily subsidized, that is, illiberal. Further, this coercive welfare state “serves” racial minorities disproportionately. Our study raises basic questions about the nature of citizenship in the U.S.
Moller, Stephanie, Joya Misra, Elizabeth Wemlinger, and Eiko Strader. 2016. “Policy Interventions and Relative Incomes of Households with Children by Family Structure and Parental Education.” Socius: Sociological Research for a Dynamic World. 2: 1-28. ABSTRACT:Cross-nationally, scholars conceptualize welfare states as both systems of stratification, reinforcing status distinctions between groups, and systems granting social rights to citizens. With growing inequality in the postindustrial era, it is particularly important to understand the role of the state in reinforcing or ameliorating inequality. The authors focus in this article on households with children, because there has been substantial polarization in income among these households. The authors consider how welfare state interventions affect a broad array of households that differ on crucial characteristics such as family structure and parental education. Focusing on European and North American welfare states between 1985 and 2007, the authors illustrate which households benefit in different policy contexts. Most policies do not have differential associations with income for mothers with different levels of education. However, tax policies are associated with variations that relate to partners’ education. Finally, childcare policies are associated with variations in income for both single-parent and dual-parent households. Moller, Stephanie, Joya Misra, and Eiko Strader. 2013. “A Cross-National Look at How Welfare States Impact Inequality.” Sociology Compass. 7(2): 135-146. ABSTRACT: A major shift in welfare state research occurred at the turn of the century as researchers moved from explaining the development of welfare states and variations in spending across welfare states to a focus on welfare state outcomes. One of the key outcomes examined in the literature is inequality. While much of the early literature examined overall spending, followed by analysis of specific taxes and transfers related to old age, unemployment, disability, health, and families, more recent research has included a broader range of welfare state policies including work-family policies and flexicurity. This essay highlights some important developments in the research on welfare states and inequality.